With all the Area Plans either in process or completed for the county, it is possible now to have a composite Proposed Land Use Map and accompanying table for GMAs 1-4 which lists the future acreage and percentages of land by use. The Proposed Land Use Map does not change the existing zoning on any property. It does provide guidance for future zoning activity and provides a framework for future public capital improvements. 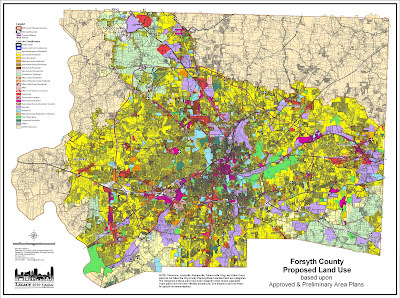 The Proposed Land Use Map serves as the blueprint for development in the county, as well as a gauge for how well we as a community are doing in applying Legacy principles in our Area Plan land use recommendations. In looking at the composite map, there is more emphasis in the Area Plan recommendations for increased residential densities along Urban Boulevards to create transit corridors. However, the primary recommended residential use for our future is overwhelmingly single-family development, even in Urban Neighborhoods (GMA 2). In spite of the recognition of recommendations for increased densities for new development, it is a struggle to move toward more diverse housing options other than single-family development where vacant land exists or redevelopment is needed. is a HOPE VI development. ﻿﻿﻿Perceptions of increased density are often associated with examples of unattractive design, crime, and lower housing values, and are hard to overcome in spite of the fact that some of our most expensive new housing is multifamily or cluster housing. In some older neighborhoods, many residents remember the fight to keep historic homes in place while apartments moved into their area. In lower-income areas, the association of density with crime has been a reality for decades. 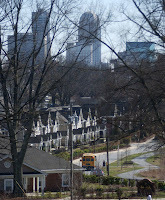 While new Hope VI and other urban developments are slowly changing perceptions, there is still a long way to go. The Proposed Land Use map shows that the nonresidential goals of Legacy have found some success. An increase in the acreage for business and industrial sites was a key recommendation of the 2001 Legacy Plan. A higher percentage of land has been recommended for industrial use through the Area Plan process. Most new commercial on the Proposed Land Use map has been recommended for designated Mixed-Use Areas or Activity Centers as shown in Area Plans. Homes affected by existing nonresidential uses or major road widening have been given a viable land use option with low-intensity office and commercial. The Legacy goal of encouraging more mixed-use development has been realized as well in Area Plan recommendations, with many older areas having been recommended for mixed-use redevelopment including older warehouse areas north of downtown, South Stratford Road and Hanes Mall Boulevard. The Proposed Land Use Map recognizes the entire downtowns of Winston-Salem and Kernersville as mixed use. A number of “greenfield” sites have also been recommended for mixed-use development such as Caleb’s Creek in Kernersville and Village Point in Clemmons.